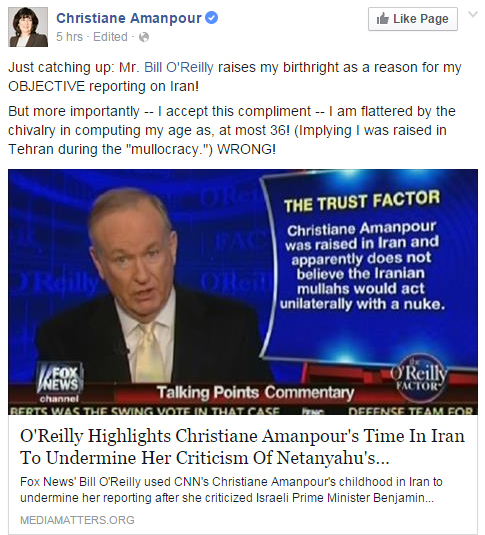 CNN's Christiane Amanpour responded to Bill O'Reilly's claims that she's an Iranian sympathiser. On March 4th, Bill O'Reilly attacked CNN's Christiane Amanpour for speaking out against Bib Netanyahu's speech and called her untrustworthy because of her heritage. Ms. Amanpour was raised in Iran until age 11 and apparently does not believe the mullahs would act unilaterally with a nuke. Anyone who challenges Bill publicly is usually attacked again.